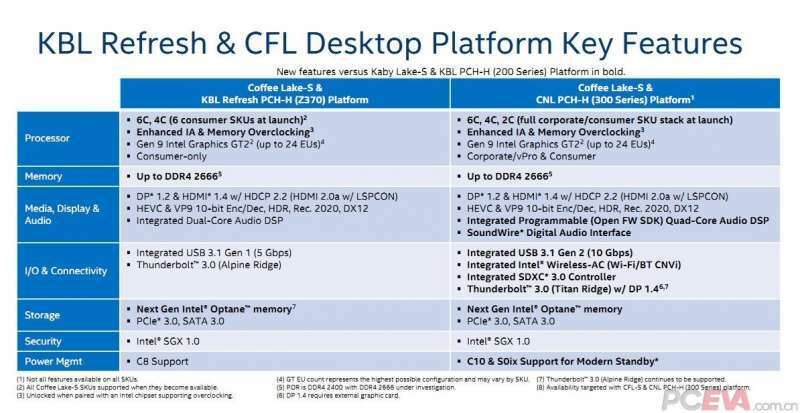 As the Intel’s upcoming 8th Generation Core Processors, codename Coffee Lake, nears its official launch, numerous leaks have been springing up on the CPUs. 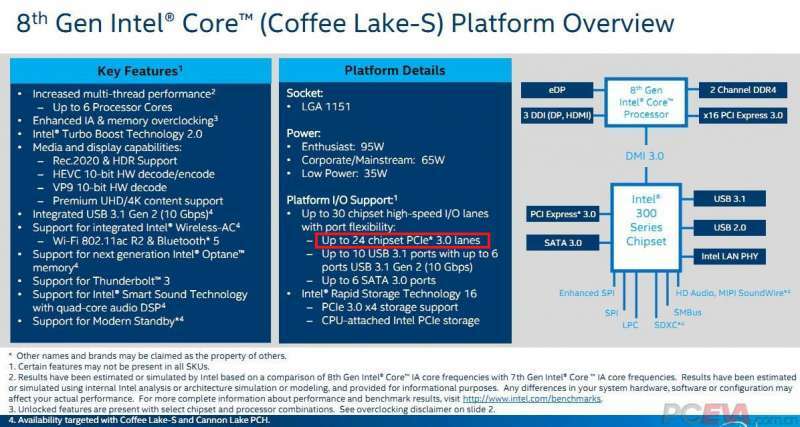 However, little was previously known about the Coffee Lake platform and chipset. Until now. In a new leak, we now have what appears to be official Intel presentation slides on the upcoming processors as well as information about the chipset and platform. For starters, here’s the roadmap for Intel’s desktop CPUs from 2Q2017 to 2Q2018. 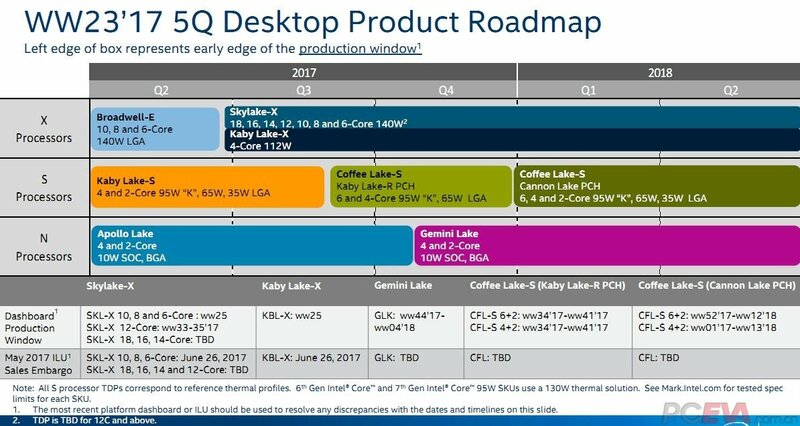 We can see that Coffee Lake-S CPUs along with Kaby Lake Refresh PCH are expected to launch sometime towards the tail end of 3Q2017 with the Cannon Lake PCH chipset launching right before year’s end. As expected, Coffee Lake-S CPUs will feature 6 and 4-core variants with a 95W TDP on the “K” SKUs and 65W TDP on the non-K SKUs. Dual Core variants will arrive at the end of the year along with 35W TDP SKUs for cooling constrained systems. Here’s a look at the details of the Coffee Lake-S platform. The Cannon Lake PCH platform will include quite a few enhancements such as the inclusion of 24 included PCIe lanes, up to 10 USB 3.1 ports with up to 6 ports for USB 3.1 Gen 2, up to 6 SATA 3.0 ports, PCIe 3.0 x4 storage support, Thunderbolt 3 support, support for Integrated Wireless AC, support for modern standby, and support for Intel’s Smart Sound Technology. Here’s a look at a comparison between the Kaby Lake Refresh chipset and the Cannon Lake chipset. The biggest difference with the Cannon Lake chipset is the inclusion of a quad-core audio DSP, USB 3.1 Gen 2, Intel Wireless-AC, SDXC 3.0 controller, Thunderbolt 3.0 (Titan Ridge), and C10 & S0ix standby support.